Discussion in 'Linux Other' started by wizardfromoz, Dec 12, 2017. First up is short and sweet, while I am still finalising material that addresses your concerns and statements above. Takes a little time, I am 5,000 years old. For the sake if this post I installed Timeshift and used it (I don't need a tutorial for that - no offense) only to prove my point. It appears you do (need a Tutorial), you have the wrong settings checked to take a full snapshot. Take this as an exercise in 3 parts, and report back, while I am finishing my submissions. Currently, you have a box or two at the left checked, or not at all. Change those to the right, that is (include everything). If there is one for User and one for Root, check both. Subtract the lower figure from the higher figure and note the results, which will tell you the space the Snapshot has consumed. Navigate to the drive and partition/s where you have your Linux Mint 18.3 'Sylvia' Cinnamon running. If you have created a separate partition for your Timeshift experiments, navigate to it, note the space consumed and write it down. Report the results back here. I may ask your for some screenshots, but the figures you report back may do. Did it just as you said - step by step. GParted report of my system. I put some English labels on this image to help you understand what is what bc my interface is in Bulgarian. There are a few files outside of "localhost" but they're a few megabytes and I don't think they would contribute so much to the total size, which is why I didn't make a screenshot of them. Which only proves my point you can't have a full system backup while the system is running. Even if there is some difference between GiB and GB, it's minor and there's still too big difference of nearly 6 GB between the snapshot and the actual size. there's still too big difference of nearly 6 GB between the snapshot and the actual size. That is so, but we are making progress, aren't we? We have gone from 2.7 GB to 7.8 GB, nearly 3 times what you thought initially? We can find the rest, I have every confidence. This is all about how your computer is configured, and how you use the Settings in Timeshift. 14.5 GB (which includes nearly 2 GB of mods for American Truck Simulator). 1. Are they captured in the screenshot? In that case, you can track it through the Timeshift snapshot storage hierarchy. Let us know if any probs. 2. Are you using a /Home partition, or a /home folder? 3. I am curious about the /media/root/Drive_E path, I take it Drive_E is a label, but the root? Nearly 6 GB is not left out by Timeshift without a reason. As you will see, if you are patient. I don't like separate partitions for home, so there's only one partition for the whole system - in root there's /home and there's /boot (grub). No swap either (with 32GB RAM there's no need for that). /media/root/Drive_E is another storage device (there's also Drive_D). I labeled it Drive_E in order to recognize it easier. There was a reason for these labels and names and it was Windows, whereas now they're just labels for easier recognition. That "root" in the path appeared after I formatted that device with ext4 file system, so that I can save the snapshot (which is one more reason to prefer Clonezilla - it can work with all file systems, NTFS included, not just ext4). Before I formatted it, the path was /media/rado/Drive_E. Gotta say this creation of additional ext4 device created a lot of troubles for me with fstab, so after I posted the screenshots, I had to reformat it back to NTFS and delete that root folder from the path. May need to go no further than this. EFI - EFI systems are supported. Make sure that /boot/efi partition is selected for mounting before restoring snapshots (application will do it automatically). Encrypted Home - For users with encrypted home, files in /home/.ecryptfs/$USER will be backed-up and restored. The decrypted contents in $HOME will be excluded. This avoids the security risk of decrypted contents becoming available outside the user's home directory. 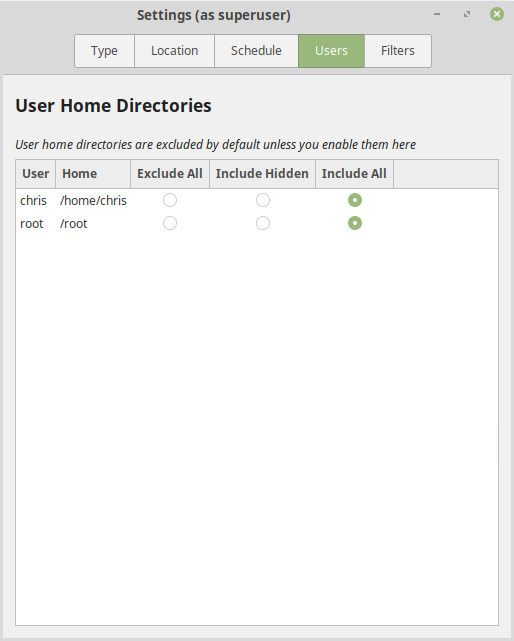 Encrypted Private Directory - For users with encrypted Private directory, the encrypted files in $HOME/.Private, as well as the decrypted files in $HOME/Private, will be excluded (as it contains user data). Filters added by user to include files from $HOME/.Private or $HOME/Private will be ignored. Docker & Containers - Docker and containerized systems are not supported. Running Timeshift on such systems will have unpredictable results. As for GRUB - there are absolutely no issues because Mint 18.3 (Ubuntu 16 and/or older) uses legacy grub which allows it to be installed inside / , instead of on the MBR. That applies to Grub2 as well. It doesn't. 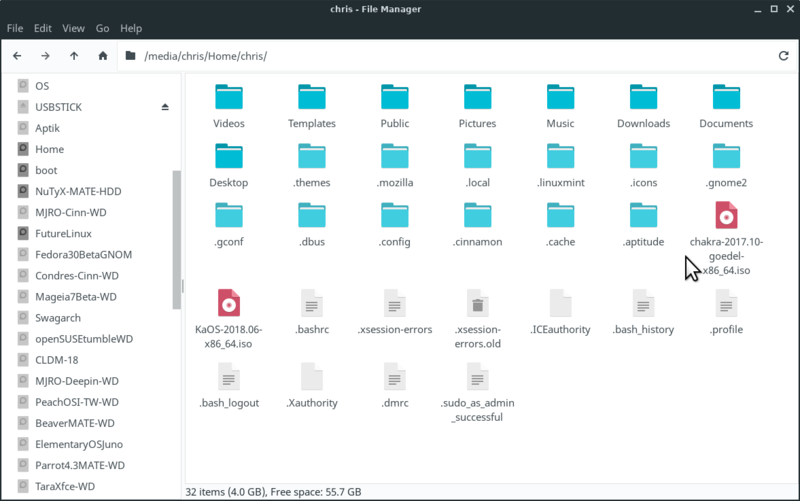 I've tried to install GRUB2 inside the file system many times (Mint 19, Ubuntu 18, Manjaro, Arch and a few lesser others) and in all of these cases when I try to do that, I either get an error while the installer is trying to install GRUB2 inside the file system, or the system simply doesn't show the GRUB2 menu and the OS wouldn't run. Rado, you are running Grub2. As the output shows. I believe you are confused between the two Grub versions. Legacy Grub, or Old Grub, as it is now known, was versions of Grub prior to v1.98. With v1.98 onwards, it became Grub2, which nowadays is simply referred to as Grub. As evidence, if you check your File System in your File Manager (Nemo), you won't find a file /boot/grub/menu.lst (which belonged to old Grub), but you will find a file /boot/grub/grub.cfg, which came in with Grub2. Here, Legacy refers to BIOS-MBR, as opposed to UEFI-GPT, which is the more efficient combination. So Legacy, BIOS, and CSM (Compatibility Support Module) are interchangeable here. I wondered with that on some of your previous references (eg Linux Mint 18.3 having Legacy Grub), and now we know. Ubuntu have had Grub2 since 11.04 'Natty Narwhal', and LTS since 12.04 'Precise Pangolin'. Linux Mint has used it ever since that time. So rather than argue with me and derailing this Thread, please do a bit of reading, or start a Thread elsewhere and I will be happy to provide input. So for now, I will get back to working on the basis that your settings in Timeshift need further tweaking which will enable effectively, a 14.5 GB usage to generate a 14.5 GB snapshot, which is what I and other users get whenever we do a full snapshot using Timeshift. My further Posts will show this. * An example of this is Linux Lite, by Jerry Bezencon, whereby Jerry will not support UEFI, so you have to install it under Legacy mode. However, once installed, it can be run in either mode. 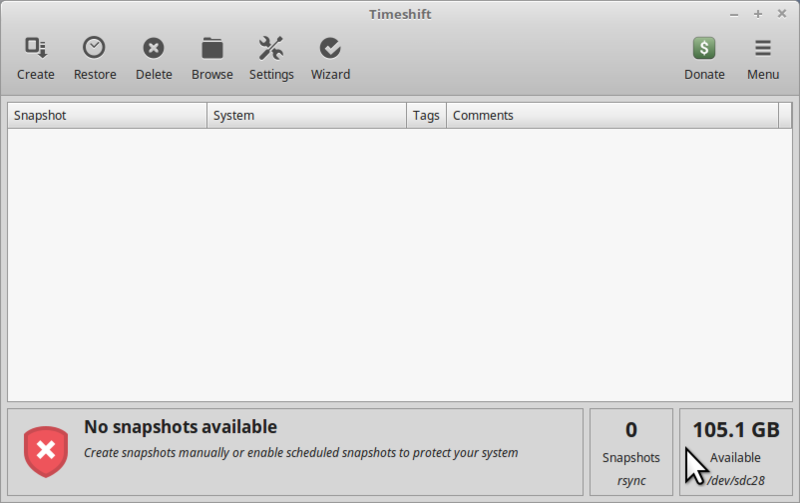 With Linux Lite, I do my Timeshift snapshots within Legacy mode, so that I do not confuse the issue and get an accurate snapshot. VP9KS, Hansel Johnson Jr, Vrai and 1 other person like this. This is a holding Post before I exit for my evening, but to assure all Users and potential users of Timeshift how to save all files and folders to restore to full functionality. Today I installed Linux Mint 19.1 'Tessa' Cinnamon, in order to help a Member with disappearing icons. The size of the new install is shown below. I have not yet run updates, only installed GParted (2MB or so), so close to stock standard. I take the full snapshot with Timeshift. The difference is 37.9 - 31.2 = 6.7 GB. Point being that all of my Distro has been screenshotted, less some incidental files open. So if Rado has 14.5 GB of space used, he should get 14.5 GB screenshot resulting. These results carry across all my 37 Distros from 4 Linux Families - Debian-based, RPM, Gentoo and Arch-based. The dedicated partition is 400 GiB. That is an average of about 10 GB/GiB per Distro, quite appropriate as my "home" is storage on a 4 TB external drive. Hansel Johnson Jr, Vrai and Condobloke like this. Getting close to my signoff time for my evening. 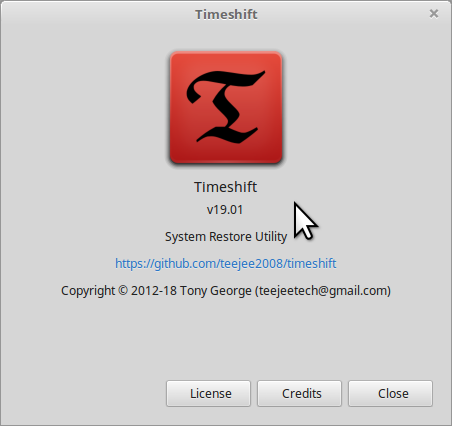 Questions have been raised about whether, when you run a Timeshift Restore, Grub, whether it is set up on your drive, or your / (root) partition, will be safeguarded, whether Timeshift will capture in it screenshot all that is needed to restore your system to its previous functionality. It can, it does, as we will see. For other purposes, I had converted my 2 TB HDD on the Dell to BIOS-MBR in order to help others using MBR-based Distros, and also for those Distros that do not use UEFI. Its GParted appearance is as follows. Initially I had a Linux Mint 18.3 'Sylvia' MATE or Cinnamon (32-bit) on here for another Member, who is waiting on a new SSD to resume activity, so I have put on a 64-bit version for now. /dev/sda6 is the "root" / partition, where the main system is housed - 20 GiB, 5.96 GiB consumed. I have only added to the base install - GParted (about 2 MiB from the Repository) and Aptik (also by Timeshift's Tony George, about 5 MiB), I have not performed updates yet. /dev/sda8 is Home, not /home, separate to the OS itself, and we are often advised to make this large enough to cater to all our data and growth demands. ...(which includes nearly 2 GB of mods for American Truck Simulator). ...Rado mentioned earlier. They might have a presence in his .config folder, or have their own dedicated eg .ATS folder, he can say. This is likely because I have installed Aptik to save settings on my Mint safeguarded, then blew it away and restored. Updates may have been run. I won't get sidetracked. So I run my Timeshift once again, with the Settings - Users set to include all. 94.8 GB left, that is the snapshot has consumed 10.3 GB or thereabouts. Next step is then for me to "blow away" LM 18.3 and restore it, but that will have to wait for my tomorrow. Vrai and Condobloke like this.